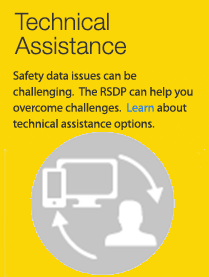 The FHWA Office of Safety established the Roadway Safety Data Program (RSDP) to advance State and local safety data systems and safety data analysis and evaluation capabilities. Vision: Toward zero deaths and serious injuries on the Nation’s roadways. Promoting an integrated, multidisciplinary (4E’s) approach to safety. Improve safety data and expand capabilities for analysis and evaluation. The effectiveness of safety programs is directly linked to the availability of sound data analysis for informed decisions. Increasingly, States and other safety partners are in need of reliable data, including crash and roadway data. For that and many other reasons, improving safety data is important for Federal, State, local, and other partners, who must overcome challenges such as lack of resources and inconsistent data systems across agencies. Improving data involves identifying and improving data quality, quantity, types, storage, maintenance, accessibility, and use. Enhanced analytical processes use procedures to better identify safety problems and select countermeasures to achieve optimal returns on safety investments. The knowledge base created by these processes and procedures also improves the ability to learn from trends in the data and to recognize the relationships between safety and other issues such as highway design, roadway operation, and system planning. Evaluation will determine the effectiveness and efficiency of traffic safety countermeasures. The successful adoption of this process should provide a strong basis for establishing safety policies and decision making for safety investments and provide a basis for the justification of highway safety projects. The safety units will work with and provide assistance to partners and stakeholders to improve data quality, analysis, and evaluation capabilities to support data-driven safety improvements and decision making. Furthermore, the use of accurate data is critical to the Highway Safety Improvement Program (HSIP) process.